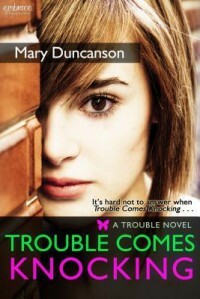 I was quick to latch on to Trouble Comes Knocking when I first read about it because it was a New Adult book that was not geared around just straight romance. This one has some romance in it but it’s not the huge part of the story this one is a mystery. I was hoping it was going to be great but instead it was just okay. Lucy has what I like to call Sherlock Holmes syndrome, she can see things about you that you might not be aware of and tell you what you just did or might be going to do. Being able to remember things because of a photographic memory sounds like it could be a good thing but not for Lucy. She is always getting herself into trouble and this time when she sees some things that are not right at her work place she tell someone. That night that person is murdered and now someone is after her. I am not a fan of love triangles and I would have thought since it was not a YA book that we might break away from those things but not so much in this book. When Lucy starts her job she meets John and they sort of hit it off, then she tell him about the discrepancy she sees. Then explains to him how she can see things others don’t and gives examples that sort of freak him out at first. Then he tells her who she might need to go see about the accounting errors. They were actually hanging out with each other when John gets the call about the murder and they both head to the office. This is were Lucy first meets Eli who doesn’t really take her serious until after his accounting people find the same errors. Then he comes to apologize and ask her to keep working at the office and report back anything she might see that is off. Lucy keeps saying that John is her type but Eli keeps doing his best to interrupt her and John. John is the lean geeky computer guy while Eli is the buff arrogant police detective. Both don’t want to see anything happen to Lucy and she always ends up needing help. You think it’s all about the mystery surrounding the death at the office then all of a sudden you are thrown into a different mystery. So it starts out with the murder of Simon Winters and then somewhere in the middle we find out that there might be a reason that Lucy is like she is and someone is after her. She starts remembering things from when she was little, things she heard her parents talking about. When this stranger ask if she is Lucy Carver she knows she has seen him before. Then she remembers that he was the guy talking to her dad when she was little, but has no clue what he wants. Lucy finds out some things about her past and her parents, but it feels like a separate part of the story. Not that it isn’t interesting and I know that it is going to be a part of the series so we needed to know about it, but it just was strange to have two story lines going at once. I was a little surprised when I found out who the murderer is, but then I had thought about him as a suspect at least once. Over all it was a good mystery and I am interested enough in finding out what happens next.